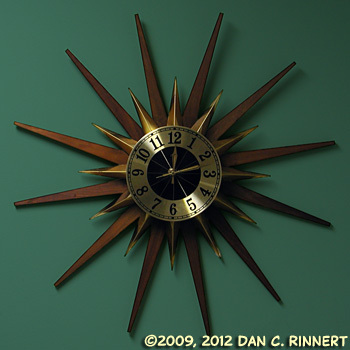 You may remember this Elgin Starburst Clock from three years ago. Same photo, same clock, but I wondered what it would look like with a different wall color. I think it looks pretty good. The color on-screen isn’t the exact color the walls may end up being, as I am working from memory, but it should be reasonably close, or at least close enough to gain some idea how it might look. I love this clock. The green wall, not so much.